SIM Bank, a SIM Box for 128 SIM cards, communicates directly with GoIPs with no SIM cards installed onboard. It allows centralized management and safekeeping of SIM cards. Hot swapping of SIM cards are supported so that no service interruptions to other SIM cards are incurred. SIM cards can be assigned to GoIP channels manually or dynamically with scheduled re-allocation algorithms. Therefore, SIM cards can virtually be moved between GoIP channels that are installed in different locations. In addition, SIM cards can be disabled based on certain triggering conditions and spare SIM cards can then be assigned to those GoIP channels. This mechanism helps to protect SIM cards from blocking and maximize the GoIP channel utilization. SIM Bank is highly scalable by using a SIM Server (a license-free utility software offered by Ultrative) to manage over 10,000 SIM cards. 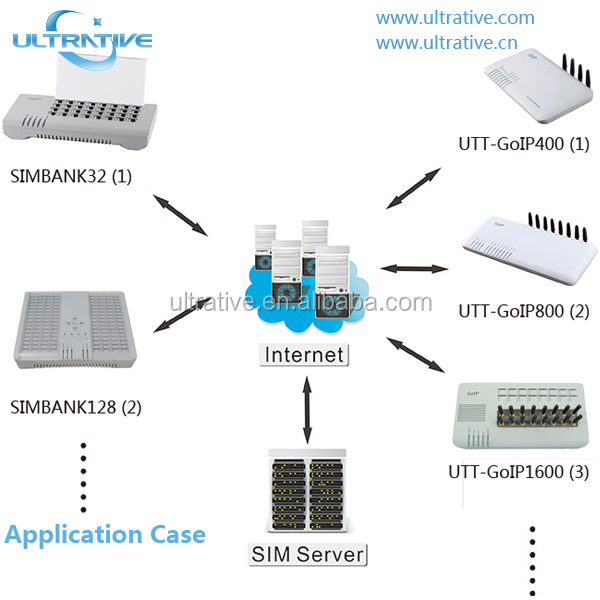 It offers many advanced features for SIM card management such as automatic status querying and recharging SIM cards. It is inevitable and valuable equipment for call termination service providers who require management of SIM cards intelligently and efficiently. Management of 32 SIM cards in standalone mode.